My name is Jenna Trullson and currently I'm a senior at Towson University. My major is Communications. I was born in Pennsylvania but lived in Maryland for most of my life. I'm addicted to sleep and have two dogs that I love to death. Enough about me, let's talk fashion! Jackets, Everyone should have one. Hey, you have some rips in your jeans! The Ugg boots. Everyone has heard about them and everyone has them, well if you don’t have them then you most likely have the knockoff cheaper version of the boots. Example, I’m one of the many that has invested money on the cheaper versions of the Ugg boots but I’ve had an epiphany. I’m a poor college kid with limited amounts of money to buy clothing. For awhile now, Bearpaw boots have kept me warm through-out those winter nights. After wearing them inside and out, I’ve found myself having to buy these boots three different times. The reasoning because they don’t last. One wrong step in these boots can mean one huge hole in the insoles. With having to buy these boots numerous times I’ve realized I could have gotten a pair of Ugg boots and still been wearing them. The negative thing about these Ugg boots are they cost so much money. 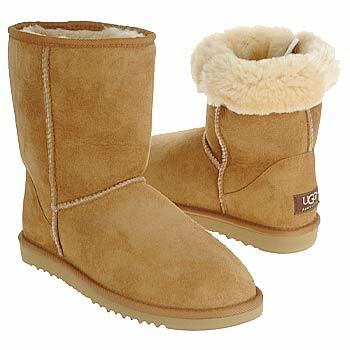 The average Ugg boots are around $140.00 while the average Bearpaw boots are around $50.00. What a difference right? Even though they are much cheaper, people aren’t taking into account the durability aspect. Usually, the more you spend, the better the quality. For this incoming winter, think wisely when purchasing those winter boots. If you go for the cheaper boots, make sure your prepared since you might have to by that same pair of boots within the weeks. Splurge if you can, it’s worth it. Subscribe to comments with RSS	or TrackBack to 'The famous Ugg boot v.s. that other knockoff'. very informative blog…correct your bio though that you’ve LIVED in md most of your life.